The wheatgrass shot from Puree Juice Bar, Bethesda, is the least-disgusting wheatgrass juice I've ever tasted. After watching the documentary “Fat, Sick and Nearly Dead,” Mr. X-sXe ran out and bought a juicer. This purchase was a point of contention, since he tends to get obsessed with one food craze, only to eventually abandon it for the next best thing (see Kombucha, Yonanas, yogurt-making). As for juicing as a weight-loss solution, we haven’t been use our juices as meal replacements so much as supplements. In “Fat, Sick,” the guys go on a crash diet, drinking only juice for months. I’m way too into my solids to give them up. Our green mocktail. See recipe below. 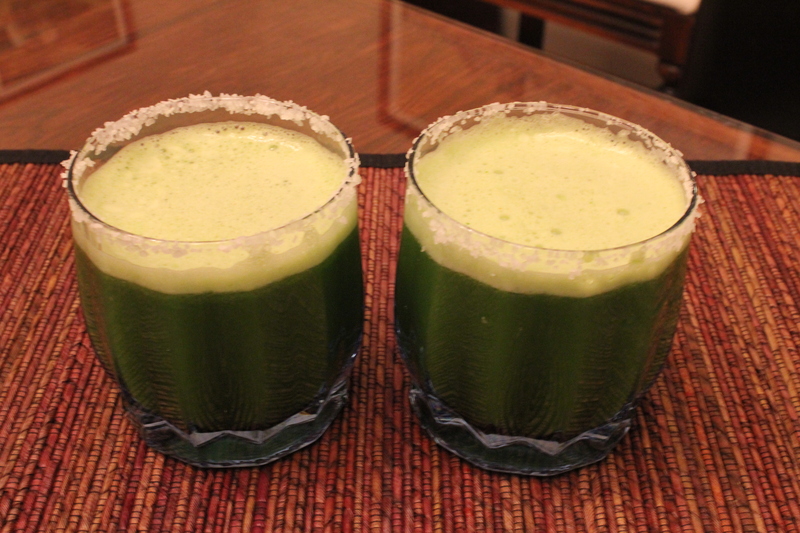 Back to Mr. X-sXe’s adventures in juicing. In a misguided attempt to be healthy, his first recipe involved Brussels sprouts, onions, kale, carrots, and asparagus. DO NOT DO EVER MAKE THIS, UNLESS IT’S IN THE NAME OF REVENGE. This “juice” stank up the entire house, literally, but he drank it anyway. Afterwards, sulfuric fumes emanated from his pores. This recipe below is a modification of the green juice. It’s really tasty–surprisingly, there are no odd flavors reminding you that you’re drinking something healthy. The fennel is not overpoweringly licorice-y, while the mint leaves a clean feeling in your mouth. “Even the burps taste good,” Mr. X-sXe commented. PS: If you can’t be bothered to buy a juicer, try Puree in downtown Bethesda. They have some really delicious concoctions. Their juices don’t come cheap, so we tend to go for the stuff we can’t make at home, like the wheatgrass shot or orange lassi (not a yogurt drink), which is so rich that it goes down like a dessert.